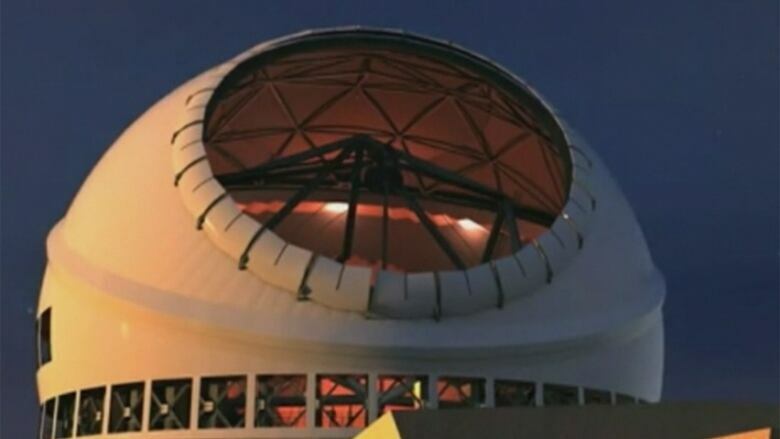 Plans to build the world's largest telescope in B.C. are under threat because Canada has yet to come through with its funding share. The 30-metre telescope, called the TMT, will be constructed in B.C. by Port Coquitlam-based company Dynamic Structures before it is shipped to a site either in Chile or Hawaii, where weather and light conditions are optimal for observations of the night sky. The $1.2 billion project is supposed to be funded by five countries. Japan, India, China, and the U.S. have all committed funds towards the $1.2 billion project, but Canada's contribution — about $200 million — has yet to be approved by the federal government. "We're concerned in terms of time. Time becomes crucial," said Dave Halliday, president of Dynamic Structures. "The most important thing is, we have got to move fast... otherwise the technology is ahead of us. Everyone has been working on this for a long time and we want some positive action." Andrew Weaver, a climate scientist at the University of Victoria and a B.C. Green Party MLA, said the telescope's funding delay is indicative of how the federal government is holding back on major projects. "This is outrageous. People do not trust Canada's participation in some of these projects now," he said. "This is yet another example of us losing credibility internationally as we back out of yet another one of our international commitments, but this one will have serious consequences." The TMT project is led by the California Institute of Technology and the Associated Canadian Universities for Research in Astronomy. Scientists hope to be able to use the gargantuan telescope to probe dark energy and dark matter, the formation and evolution of galaxies, and black holes and the origins of stars and planets.